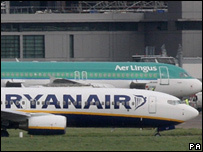 Budget airline Ryanair has pushed ahead with its 1.48bn euro (£1bn; $1.9bn) takeover offer for Aer Lingus, by upping its holding in its Irish rival. Ryanair has now amassed a 19.2% stake in the firm, having said it held 16% when it launched the offer on Thursday. Aer Lingus has spurned the offer saying it "significantly undervalues the group's businesses and attractive long-term growth potential". Irish government ministers will try to block the bid in court, a report says. Analysts argue that the bid is a risky strategy and a change in direction for Ryanair. Chief executive Michael O'Leary was critical when Easyjet bought Go! in 2002, arguing that low-cost airlines should not make acquisitions as they added complexity and often costs. The takeover approach by Ryanair comes less than a week after Aer Lingus was privatised, with shares trading in Dublin and London. Ryanair is offering 2.80 euros per share for the shares it does not own - 27% more than the flotation price. The union Siptu said the Irish government should have never agreed to sell much of its 85.1% stake in the airline, and called on it to block the takeover by snapping up Aer Lingus shares. "There is no point the government standing by and wringing its hands, like bystanders at a mugging," said Mick Halpenny, the union's national industrial secretary. "It is entirely responsible for this debacle and must act now, while the situation is retrievable." But Irish transport minister Martin Cullen insisted privatisation - which was carried out to raise funds for investment - had been the correct move. "There's no question that the decision the government took is still the right decision," Mr Cullen said. The Irish government owns 28.3% of Aer Lingus and insists it will not sell its shares - though Ryanair has said it would be happy to go ahead with the government maintaining its stake. According to the Irish Times, the government is considering mounting a legal challenge to the bid on competition grounds - referring it to the Competition Authority in Dublin. A takeover would almost certainly be referred to the European competition regulators because a merged group would have a 78% share of the London to Dublin route. Mr O'Leary said the move was a "unique opportunity" to form a "strong Irish airline", carrying more than 50 million passengers each year. If the bid was successful, he said the plan was to continue to operate the two airlines separately and compete on the 17 routes which both use. However, some analysts say that it is inevitable that at least some parts of Aer Lingus will be run on the Ryanair model, and that there will be job cuts.